Hi from Mountain View (and from a backup computer, but that's another story). 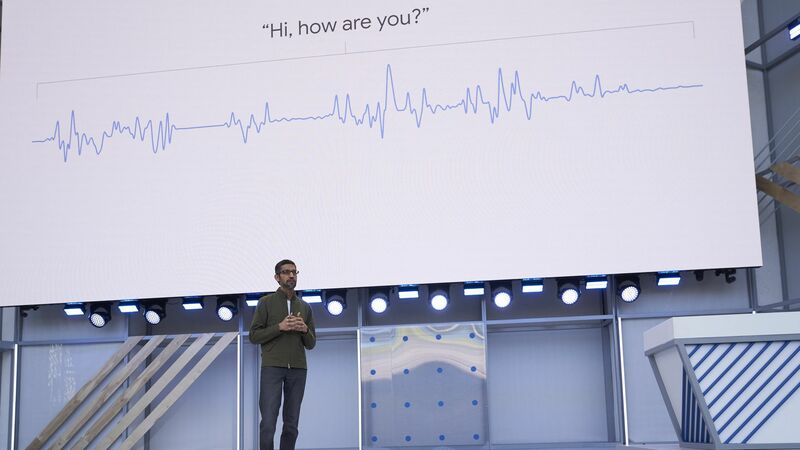 Google's opening I/O keynote had a lot to digest, but three developments struck me as standing out — the biggest being Google Duplex's chatty conversation. 1. Google's robotic assistant can convincingly converse with a person to make a reservation. With its all-too-human sounding "umms" and its versatility of responses, this was the demo that had everyone talking — with a mix of awe and concern. Why it matters: Though incredibly impressive, there are a lot of questions about just how far Google has gotten in its effort to get its robot assistant to reliably converse with a human. That Google can do it successfully even part of the time is an impressive feat. It's not quite passing the Turing Test, but it's a big step. The big question: Namely, should a robot have to disclose itself? Google is in a bit of a bind here. But, I think that most people today would be annoyed to learn they were unknowingly talking to a computer — or as Chris Messina put it, being turned into an API endpoint. 2. Technology that encourages you to use it less. A big theme was digital well-being, including features in the Android P operating system that will inform you on how you're spending time on your mobile device and suggest ways to pare back usage. 3. Maps that see what you see. This wasn't the biggest announcement of the day, but it's the kind of thing that we could look back on one day and wonder how we lived without it. What else: Google also introduced a revamped Google News, AI-infused updates to Google Photos and new voices for Google Assistant. What's next: I/O continues today, though the big announcements are probably over. As of this week, Google, Microsoft and Facebook have all had their big annual gatherings with developers, but Apple takes its turn next month, where it is expected to detail the next versions of macOS and iOS. Go deeper: Read the full story here, check this summary of all the big conference news, and watch our Axios stream coverage during the day to stay up-to-date. Google's in-car efforts didn't garner much of a mention in the keynote at I/O, and its demo was tucked away in a distant corner of Shoreline Amphitheatre. However, the company's effort to take over the infotainment console of the car appear to be chugging along. What it showed: Google demonstrated Android P powering the in-car navigation and entertainment system on both a Volvo car and Dodge Ram truck. The operating system was able to handle maps, serve up Google Assistant, adjust seats and air conditioning, and download car-friendly apps from Google Play. Why it matters: Unlike Apple CarPlay and Android Auto, this isn't a secondary system that shows up only when a smartphone is in the car. Instead, Volvo (and Audi) are using Google's flavor of Android to power the infotainment system itself. That means a more permanent spot in the car for Google, something it clearly covets. The logistics: Volvo had said last year to expect Android-based systems to show up in about two years. A Volvo executive told me Tuesday that it's still probably one to two years out and likely to show up in one model first, before eventually becoming the company's standard over time. Facebook’s privacy woes are seeping into Capitol Hill conversations about how drones should be deployed in national airspace, Axios' Kim Hart reports. Why it matters: As drones slowly start to fill the skies, there’s a potential for them to use facial recognition technologies, infrared cameras and powerful zoom photography to see who’s walking down Main Street or which car license plates are driving into health clinic parking lots, Sen. Ed Markey (D-Mass.) said. If privacy hawks have their way, it may not be enough for drone-building companies like Amazon or FedEx to commit to voluntary privacy standards. What they’re saying: Markey told the Federal Aviation Administration that part of the agency’s job is determining what data privacy issues need to be regulated when it comes to drones. Earl Lawrence, director of the FAA’s Office of Unmanned Aircraft Systems, insisted during a Senate hearing Tuesday that the FAA’s primary job is to protect safety. “Our expertise is in the safety arena,” Lawrence said. The big picture: Notably, concerns came from both sides of the aisle. Sen. Roy Blunt (R-Mo. ), chairman of the Senate Commerce aviation subcommittee, said he agreed with Markey’s concerns. He joked that it’s an area where Democrats and Republicans may finally find common ground. “After all these years,” Blunt said, “this might be it." A group led by Democrats will file a petition today that will force the Senate to vote on a resolution rolling back the Republican Federal Communications Commission's repeal of net neutrality rules, Axios' David McCabe reports. Quick take: It brings the net neutrality issue back to the fore during a midterm election year, and Democrats hope that will resonate with younger voters. The math: The measure has 50 supporters, including Republican Susan Collins and every Senate Democrat — leaving it one vote short of passage. With 50 votes, the resolution has the support it needs to pass the Senate should Sen. John McCain be absent, as has been the case during much of his cancer treatment. Tech firms that support net neutrality rules — banning internet providers from engaging in blocking, throttling and paid prioritization — will add messages about the issue to their websites starting Wednesday. Yes, but: The Senate was always the easy part. The measure has a much harder road in the House and could still be vetoed by President Trump. Intel's venture arm announced Tuesday it's partnering with the National Basketball Association on a multiyear effort to invest in tech startups with the potential to significantly shake up the sports world. The context: Intel has made sports tech (especially virtual reality) a key investment area. It already has a partnership there with the NBA to use its virtual reality technology. Separately: The chipmaker used its annual Intel Capital Global Summit to announce $70 million in new investments in a dozen startups. Google I/O continues in Mountain View, Microsoft's Build wraps up in Seattle, and Uber's Elevate Summit flying car conference concludes in LA. IAC reports earnings after the market closes. Facebook made a sweeping reorganization, placing Messenger, WhatsApp, and Instagram under Chris Cox. David Marcus, who had been running Messenger, will head up a new team focused on blockchain-related initiatives, along with Instagram product chief Kevin Weil. News Feed chief Adam Mosseri is heading over to Instagram to take Weil's VP of product job. Chris Daniels, who had been running Internet.org, will lead WhatsApp. Separately, Recode reports that Facebook added Jeff Zients, a former member of President Obama's National Economic Council, to its board of directors. He fills the spot vacated by Jan Koum. Nextdoor is announcing today that Lauren Nemeth has joined as chief revenue officer. She previously held that position at digital marketing company Amobee. Many Amazon employees are unhappy the company is opposing a shareholder proposal that aims to foster more diversity in its board ranks, according to Recode. A growing number of cities are fed up with Waze and the impact the Google-owned mapping service is having on traffic patterns, CNBC reports. Slack reported it now has 8 million daily active users. On the paid side of things, it has 3 million users representing about two-thirds of the Fortune 100. AT&T confirmed it made a payment to a company controlled by Trump lawyer Michael Cohen. The White House is scheduled to hold a meeting Thursday on issues related to artificial intelligence. Glassdoor is being sold to Japan's Recruit Group for $1.2 billion. The wealthy have approximately $10 billion of Bitcoin stored on 5 continents in underground Xapo vaults that include fingerprint scanners programmed to prevent the use of amputated hands, according to Bloomberg. Thought I'd try a tearjerker for a change. Get your Kleenex ready.